While it’s easy to find, it was difficult to find a parking on a Sunday afternoon. Been here once few years back and revisited just recently, I think it has maintained its quality of service and food. Full house by 2PM. Luckily we arrived just before 2PM and didn’t need to wait. I ordered a flat white to start – it was good, a bit milkier than my usual go-to flat whites. J ordered the Post Workout Smoothie for $10. Vegetarian and Gluten Friendly. Banana, Blueberries, Peanut Butter, muesli, dates, chia seeds and coconut milk with extra raw protein. Disappointed by the size it came out in. Expect it to be very dense and grainy – of course from the muesli. Couldn’t taste any peanut butter as it so claimed. Pretty but won’t re-order. I ordered the Dead Man’s Egg Benedict – Smoked pork neck on Dr Marty’s Crumpet, kale and poached eggs drizzled with enough hollandaise sauce. Only a hint of smokiness but the kale was the star for me. Fried and crispy. J liked it. Poached eggs were perfect – running down the plate as I cut it in half. The Crumpet was a good substitute of muffin/sourdough. Because the crumpet was a little moist already from the toppings, it didn’t feel try when dipped with hollandaise sauce. 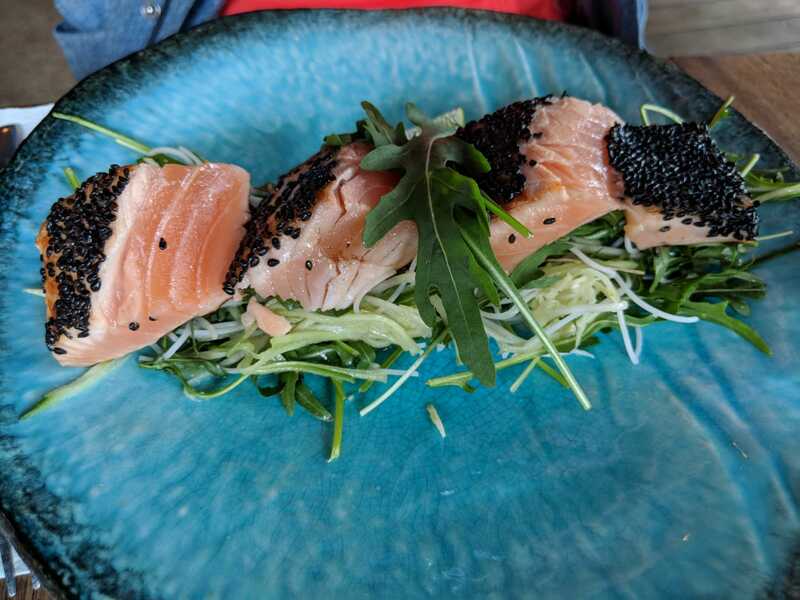 J ordered Seared Cured Salmon, $22 gluten free – 24 hour citrus cured salmon with shredded green apple (it says mango on the menu), black sesame, vermicelli and rice vinegar salad. Pretty on a plate, but knowing it’s 24 hour citrus cured – I couldn’t taste a strong sense of it. Flavours were very mild. I liked the black sesame toasted on top as the salmon’s skin. Gave it texture as the skin. J said his dish was good but light. Overall, I’m happy that Dead Man Espresso has maintained its service and food, but the food is not WOW like some other places in South Melbourne. A good place to go to once in a while.